This week's space is full of teeny tiny beads. 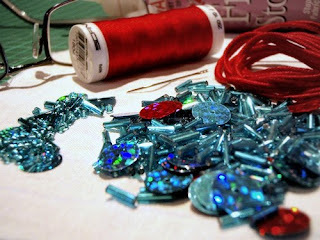 I'm working on a name tag swap for Sew It Together, a sewing and craft blogmeet being held in May. My partner's name is being couched in satiny red braid and I am filling the background with little aqua sequins, round beads and bugle beads. I hope she doesn't mind a bit of sparkle. I have to admit that I have found the near-work incredibly tricky. While I have been joking for some time about my eye-sight, it never occurred to me that I might need spectacles. Mostly because I already wear glasses. According to an eye test yesterday, I now need two pairs. But not at the same time of course, because no one wants to be called six eyes (unless you are a fly, in which case that is a compliment). The new glasses won't be ready until the day after the swap is due, so between now and then there will be much stitching at arm's length. Oh look ... more sparkles. as soon as i saw the colours i knew you were making my tag swap! LOL you're making me feel inadequate in the sewing department LOL. i can't wait to see this finished. How funny - I also wear glasses already for distance, and last week I discovered I need reading glasses too! Got them this morning, and OMG - what a change! I can seeeeeee!!! Your glasses look funky, and with those great colours I bet your beading work turns out great! p.s- you totally cracked me up with the fly comment. Looks like it's going to be gorgeous. Hopefully you can see that too!!! Sounds like its going to be sparklearkliscious! PS, I'm hoping your recipient has a really short name so as your eye sight doesn't give out completely. 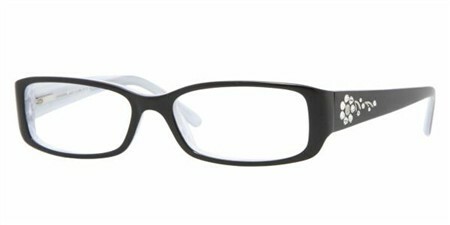 I've got the with my eyes and got varifocal glasses. Just point your nose at what you want to see and voila!! perfect focus. On the plus side according to my optician as the long sightedness gets worse, the shortsightedness gets better. Long term, I'm going to have perfect eyesight when I am 72. The colours you have chosen are gorgeous , and a bit of sparkle is always good thing. Blimey. The sequins sent the eyeballs over the edge. You could always wear one of those glamour headlight, magnifying glass thingies a la MacGyver? Yummy colors! I've no patience for teeny-tiny anything, but am a little in awe of your fortitude. D'you know, I think I need to enter the world of four eyes very soon - my jewellery-making is becoming more tricky by the week.